This app has been moved over to the official Palm App Catalog in the beta section. Download it here or serch for it in preware. For some reason precentral keeps stripping out the URL and won't let me edit all the meta-data for this app. 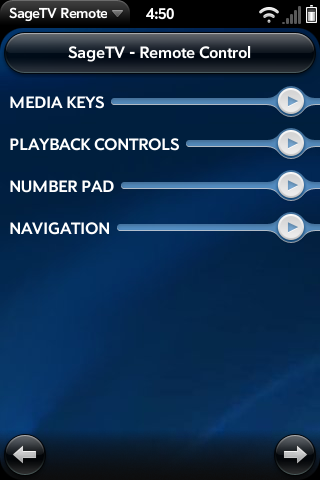 This is a front end to the remote control feature of nielm's web server for SageTV. You must have the server properly installed and configured before attempting to use this application. Setup is simple and functions are grouped into four major categories as seen in the screenshots. If you like this app, please donate. Your time is worth money and so is mine.